Newark's Weequahic section is in many ways an enigma. While it was one of the city's most recently developed areas, it also was the site of many of Newark's earliest homes and farms. The area originally was part of Newark, but was separated as part of Clinton Township before rejoining Newark in 1902. Weequahic also is unique since it is Newark's only section bearing an Native American name. Translated, it means 'head of the creek or cove.' Originally, it was the dividing line between the Hackensack and Raritan Native Americans. By the 17th century it had become the boundary between Newark and Elizabeth. Weequahic Lake actually is an ancient remnant of a long-vanished river bed. It now forms the lake for which the park and section was named. Earliest references to the area describe it as 'a place where hunters tracked down rabbits, and flower-lovers plucked wild blooms along dusty country roads.' For more than 200 years it was generally referred to as Lyons Farms or Connecticut Farms, and included portions of Newark, Elizabeth and Union Township. In 1696, Henry Lyons deeded six acres to his son-in-law, a gift increased to eventually include more than 300 acres. 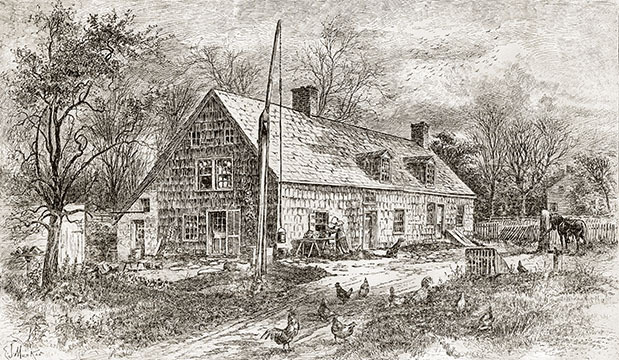 The old Meeker Place, owned by Josiah Meeker, was built in 1676, and survived until 1914. The antique farmhouse saw the movements of both British and Continental soldiers during the Revolution. In 1824, Gen. Lafayette visited. Other early farmers living in the area are remembered only by the names of the streets now bearing their names. This long-gone company includes William H. Goldsmith, A.S. Baxter, William Grumman, Henry Meeker, Mrs. Nancy Nye, and Professor James Mapes and his daughter, Mary Mapes Dodge. Lesser known, but equally interesting, was Ichabod Grumman, who brought news of Cornwallis' surrender at Yorktown by horseback from Philadelphia. Chancellor Avenue was named for Chancellor Halsey since Halsey Street already existed. Originally, Chancellor Avenue was known as Pot Pie Lane, a tribute to dinners supposedly served there during the Revolution. Early landmarks not only included the lake and the old Meeker homestead, but also the Lyons School Farm School House, formerly located at Chancellor and Elizabeth avenues, built in 1784. In 1938, it was disassembled and reconstructed in the Newark Museum garden, where it can be visited today. Another interesting landmark which did not survive, and about which little is known, was the home of Samuel Remson, son of a former slave. It is now the site of Weequahic High School. During most of the 19th century, Weequahic was caught up in agricultural and horse-racing pursuits. Originally, it was the home of farmers, including the Meeker family. Gradually, it gave way to an agricultural fair and even more elaborate racing events. While the dates differ somewhat, according to sources used, horse racing was introduced to the area around 1856. From 1857-98, the Waverly Fair was held there. In 1866, the New Jersey Agricultural Society bought 79 acres for a fairground. The Waverly Gentlemen's Driving Club held races on Saturday afternoons and on holidays. In 1872, President Ulysses S. Grant attended several races while visiting Newark's great Industrial Exhibition. For more than 40 seasons, races were held from Memorial Day until Columbus Day, a splendid period in the city's sporting history. Because the fair lost money, the site eventually was sold to the newly established Essex County Park Commission in 1897. Still horse racing continued under the sponsorship of the New Jersey Road and Horse Association until 1943, when the track closed for use as a World War II veterans’ hospital. In 1955, limited racing was resumed under the direction of the Weequahic Park Amateur Trotting Club. This lasted until 1961. In 1963, the Essex County Park Commission informed the Weequahic Trotting Club that the track could no longer be used for horse racing and would become the site of 'more general recreational use.' So ended a remarkable chapter in Newark's 19th century history.